Even a snowstorm during the show couldn’t keep the serious buyers from attending and spending money. The Progressive New England Boat Show, which ran Feb. 10-18 at the Boston Convention and Exhibition Center, wrapped up with 50,997 visitors, the highest attendance at the show since 2010. Attendance was up 9 percent from 2017, which had a snowstorm on opening weekend, and was up from the previous record attendance in 2016, which was 50,706. 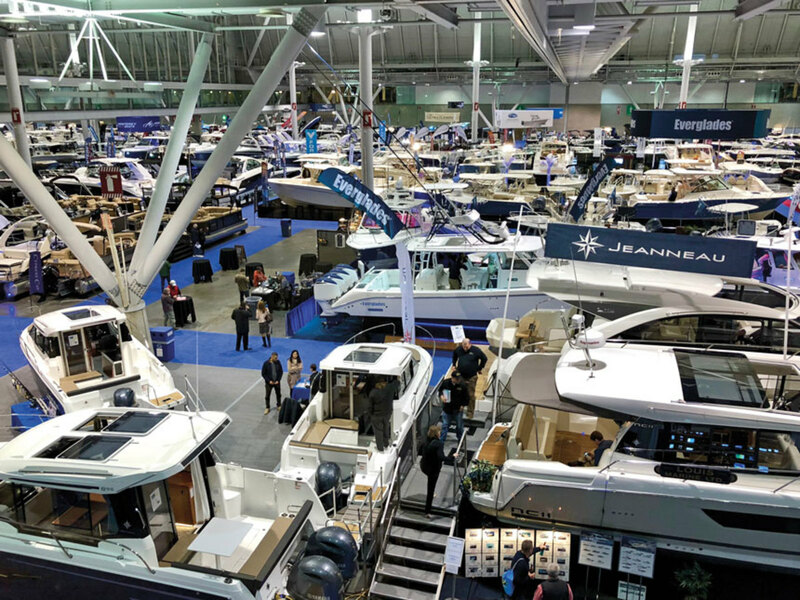 Exhibitors reported strong sales, with some saying it was their best show yet in Boston, according to the National Marine Manufacturers Association. February was a wild month for the stock market, with two 1,000-point plunges for the Dow Jones Industrial Average, but boat buyers were not deterred. Wally Eastman with Monahan’s Marine in Weymouth, Mass., which sells Achilles and Highfield inflatables along with Hobie, NorthCoast and Tidewater boats, said the show’s opening weekend was much stronger than in 2017. Approximately 100 students attended the show’s first Boating Career Day. The “Touch a Boat” tour for kids had about 1,850 participants, and Boston’s ABC TV affiliate covered the show, interviewing winter-weary attendees. Organizers also promoted the show’s first Boating Career Day, which drew about 100 students. During the event, 3A Marine founder Ed Lofgren told students that the marine industry is desperate for service technicians, mechanics and manufacturers. “They want to know that you want to be there.” Acosta emphasized that careers often take new paths, and that although kids had career opportunities without needing four-year degrees, they might choose to obtain one later, and potentially return to the industry in a different capacity. 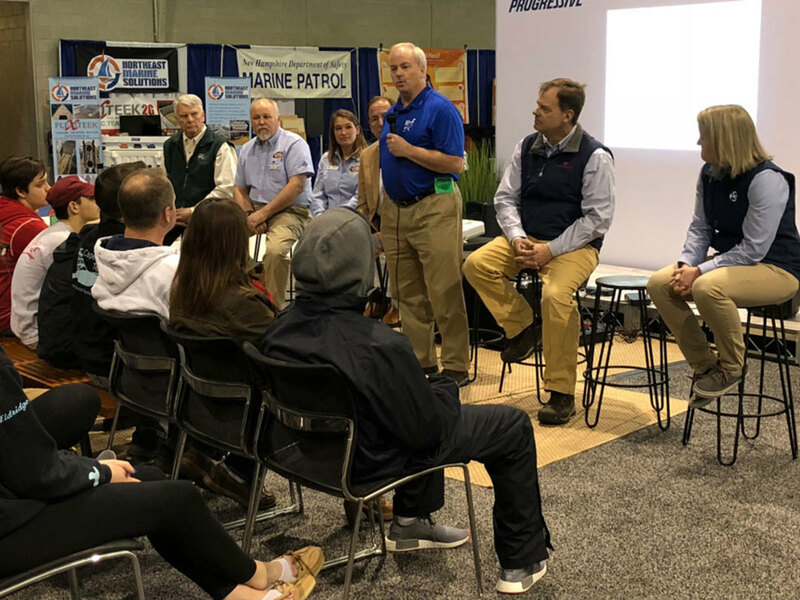 Students of all ages, from high-schoolers to adult learners, seemed engaged in the stories from panelists and speakers who explained their sometimes-meandering paths into the marine industry. Massachusetts Marine Trades Association Executive Director Randall Lyons said he’d cleaned heads at a marina during summers before moving on to other positions. Panelists also included Alyssa Linkamper of Brewer Onset Bay Marina, who began her career in the military; Stephanie McLaughlin of Brewer Plymouth; Goose Hummock, lead service manager John Bernier; Lofgren; Tim Moll, regional vice president of New England and East for Safe Harbor Marinas; Scott Smith, principal at Boston BoatWorks, which builds MJM Yachts; Boston Whaler regional sales manager Doug Nettles; and Larry Russo with MarineMax Russo. They outlined pay scale and opportunities for advancement in the industry to students who seemed surprised to learn they could earn six figures as a marine technician.